Significant savings of coating materials, reduction of overspray and rebounding paint and a cleaner environment. 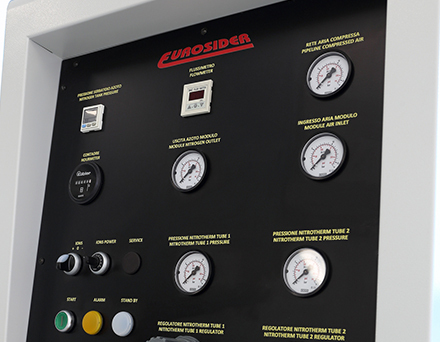 The Nitrotherm Spray System from Eurosider is a revolution in coating application technology. Nitrotherm Spray gives unprecedented control over the coating process and very high quality results. Nitrotherm Spray generates significant savings of coating materials, reduction of overspray and rebounding paint, cleaner working environment, improvements in finish and reduction in application time. Nitrotherm Spray uses a flow of clean, dry, ionized nitrogen as the fluid carrier. It enables constant humidity and temperature, two critical aspects of the spray painting process which can now be managed for the first time. Application conditions can be controlled and consistent all day and in all seasons. The technology also has adjustable polarity to promote attraction to different substrates and drastically reduce impurities in the finish.